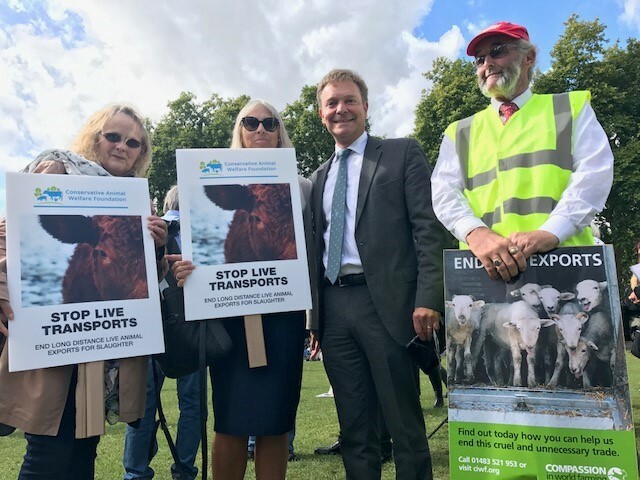 On Wednesday, 13 September, South Thanet’s Member of Parliament, Craig Mackinlay MP, joined Conservative Animal Welfare Foundation, Compassion In World Farming and other like-minded organisations and individuals at a rally in Parliament Square in support of this year’s ‘Stop Live Transport: International Awareness Day’. Millions of live animals are transported thousands of kilometres every year. These long journeys result in immense suffering. Many animals receive insufficient food, water, rest and space to move, and face inhumane treatment at slaughter. At the event, Craig Mackinlay MP, who is hoping to re-introduce a Private Members Bill which would remove the obstacle in UK law preventing local authorities from banning live animal exports for slaughter, addressed the rally encouraging people to speak up for farm animals and make it clear that it is time to stop these horrifying journeys. Disappointingly, the first live animal shipment of the year left from Ramsgate on Wednesday 9 August. “I was delighted to be invited to address the Stop Live Transport event on International Awareness Day and to reassure the protesters that I will continue to campaign for the removal of the obstacle in UK law that prevents local authorities, such as Thanet District Council in my South Thanet constituency, from banning live animal exports for slaughter. “Now that we have voted to leave the European Union, this leaves the UK in a better situation to ban live animal exports. The European Commission have been firm in that they would not accept any change in UK law regarding live animal exports because it would break EU rules on the free movement of goods. I am hopeful that as negotiations progress with the EU, we will finally put a stop to this barbaric practice.